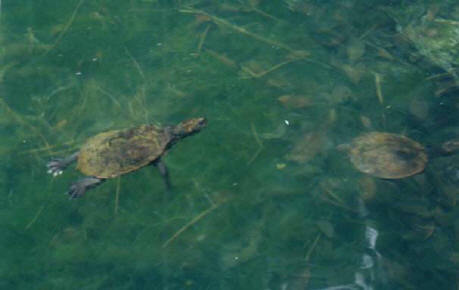 Other Names: Saw-shelled Turtles Elseya spp. This genus of this turtle has at least seven species (Cogger 2000). These turtles look and behave much like their close relatives the 'Australian river turtles' in the genus Emydura. Like those, they have moderately short necks with largish heads. Also like the river turtles, they are found in creeks and lagoons in Australia and New Guinea. Here, they can often be seen basking on logs and the sides of waterways; if disturbed, they drop into the nearby water with a splash and disappear. For many observers, this is the only evidence that they are around. However unlike the Emydura, they get a little bigger, with some developing a carapace length of 45 centimetres (Cann et al 2000). They also often develop a hard horny head and have much more obvious tubercles on the neck (Cogger 2000). They also lack the pale stripe on their face that is present in the Emydura species. 'Saw-shelled turtles' are also called 'Snapping turtles' in Australia. However, they are not related to the 'snapping turtles' of the Americas that bite much more readily and can often be much bigger. Australian 'snappers' are usually quite shy and would only resort to biting if handled. They are also called 'saw-shelled turtles' because many individuals have serrated edges to the carapace, especially when younger. They can sometimes be seen in the bigger fresh waterways, such as at Mossman river, basking on the rocks in the morning.